It says Germany on the bottom. It is likely from the 1950s, and possibly a reproduction of an antique dish. Muffin Pan Set. Wonderful treasure to add to your dollhouse! Perfect accessory for your dollhouse kitchen. Cookware Set. Wonderful treasure to add to your dollhouse! Perfect accessory for your dollhouse kitchen. Dishware Set. Wonderful treasure to add to your dollhouse! Perfect accessory for your dollhouse kitchen. Size: Total Length 5cm 2". All Pictures Are Made By Myself, What You See Is What You Get! Dollhouse Miniature 1:12 scale 10 piece ceramic tea set, lids on tea pot and sugar are removable. Pretty set white glazed with pink roses with blue trim and edged in gold Approximate size of tea set, tray 1 1/4" wide x 1 3/4" long. Size: Height Of The Cooker Is About 2cm 4/5". All Pictures Are Made By Myself, What You See Is What You Get! Use classic view and open tab. Auctiva's FREE Counter. Cooper Colander. Perfect accessory for your dollhouse kitchen. Wonderful treasure to add to your dollhouse! All Pictures Are Made By Myself, What You See Is What You Get! Size: Length 3.2cm 1"1/4 ; Height 2.1cm 4/5". Size: Length 3.2cm 1"1/4 ; Height 2.1cm 4/5". All Pictures Are Made By Myself, What You See Is What You Get! 1:12, super tiny eggs. All Pictures Are Made By Myself, What You See Is What You Get! All Pictures Are Made By Myself, What You See Is What You Get! Bundt cake Pans. Perfect accessory for your dollhouse kitchen. Wonderful treasure to add to your dollhouse! This is a really lovely pattern of lilac on white dishes that would look beautiful in a china hutch. I believe it is 52 pieces, although it may be 51. I really don't have much more of a description as to manufacturer, etc. These are the typical 1" scale dishes. It appears to be a service for four, with many extra serving pieces, along with goblets, bowls, and platters. There are four serving utensils. The receipt says I paid $42.00 for this set from a reputable U.S. seller. This is a really nice set and is still in the box covered by hard plastic. It was kept in the box it arrived in and has been stored in my smoke-free home. Please feel free to ask questions. I do combine shipping if an invoice has been requested. Wonderful treasure to add to your dollhouse! Perfect accessory for your dollhouse kitchen. Pot & Pan Set. Nice covers and nice backs but do not open. Miniature Dollhouse 1" Scale. It is unmarked and in 1:12 Scale. The coffee pot is about 1" high including the removable lid. From the 1980's. Good condition. See Photos. Sale is for the 4 piece set only, no other pieces are included. Dollys Gallery. Dollhouse Miniature Wood Rolling Pins for your Mini Kitchen. 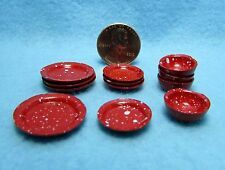 color:red A set of dolls house miniature kitchenware cookware Fit for 1:12 scale dollhouse decoration Great for people who like DIY Note: For decorative use only, not a toy! Chocking Hazard - Small Parts! Not for children under 3 years! Material: plastic Package Contents:13 pcs dolls house miniature kitchenware Note: Light shooting and different displays may cause the color of the item in the picture a little different from the real thing. The measurement allowed error is /- 1-3cm. Cookie Jar. Wonderful treasure to add to your dollhouse! Hand crafted cookie jarwith an apple design. Perfect for any counter top display. Dollhouse Miniature Tea Set J. This set is White with Coral. This is a beautiful miniature tray for a dollhouse ~ I suspect it is silver plated, though I am not positive. It did seem to clean up when I used silver polish. 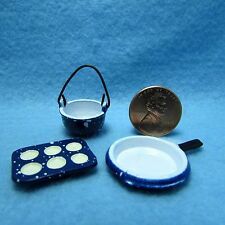 Miniature Bed Breakfast Serving Dish. New ListingLot of 10 Dollhouse Miniature Food set, cookie, hamburger, cake, milk, turkey..
Super Cute Miniature food set! All Pictures Are Made By Myself, What You See Is What You Get! Dollhouse Miniatures, Salt and Pepper Shaker Set, 1/12th Scale. Condition is New. Shipped with USPS First Class Package. This is a nice pair of plastic wine glasses filled with pink-tinged "wine", crafted in dollhouse (1:12) scale. These stems are 1/2" tall and appear a tad peachy-pink in reality, rather than yellow as in the photo. A relative of mine collected these Dollhouse miniatures back in the 1970's. These are mostly NEW, as they were never put in a dollhouse by her. They have been boxed up for about 40 years.They are sold inAS IS CONDITION ; I have tried to explain them as best I can. Porcelain Pedestal Cake Stand with Paper Doily. -Paper doily made in USA (. -Cake stand made in Thailand. Material: Porcelain. ~item may vary slightly from photo due to small scale~. ). New ListingDollhouse Artisan Miniature Aged Roaster Pan! Tea Kettle with Lid. Perfect accessory for your dollhouse kitchen. Wonderful treasure to add to your dollhouse! Miniature dollhouse / craft bowls. Finish: Unfinished. Set contains serving plates with flower and cherry motif. Miniature primitive snowman. Finish: Unfinished. This cute little 1/12th scale yellow porcelain canister with lid would look great in your dollhouse kitchen! The lid is removable and there is plenty of space for dollhouse coffee, etc. The canister is 0.75 inches tall, by 0.5 inches wide. 6 little 1/12th scale cups, or mugs, made of blown glass. 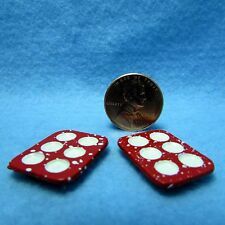 These would be great for your dollhouse or fairy kitchen. The glasses are each 0.25 inches tall, by 0.25 inches wide. Antique Victorian to Early 1900s Dollhouse Dish. This is a miniature antique serving plate for a dollhouse. It has a lot of tarnish! There are two available ~ you can select quantity when you check out. Dollhouse Miniatures, Drinking Glass in Metal Open Cup, 1/12th Scale. Condition is New. 0.5 inches tall. Dollys Gallery. 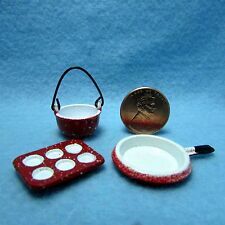 Dollhouse Miniature Kitchen Cook Pot. Made of Porcelain. Dollhouse Artisan Miniature Aged Roaster Pan!